Dan Kielty and Marks-A-Lot Kennels have more than 1250 AKC hunting titles including 268 Master Hunter Titles to their credit. They regularly take a team of canine athletes to the AKC Master National where they have passed the youngest dog in the series at 22 months (2012) and placed 10 retrievers in the Master National Hall Of Fame, including the youngest - Tennessee's Belle Of The Ball (2013). Marks-A-Lot Kennels is a professional hunting retriever training facility that specializes in training hunting dogs. Marks-A-Lot offers hunting retrievers, started and finished trained dogs, working dogs, AKC Master Hunters, water dogs, AKC and UKC hunt test dogs, gun dogs, duck hunting dogs, field dogs, Texas duck hunting, Water Fowl hunting and obedience training for all breeds. 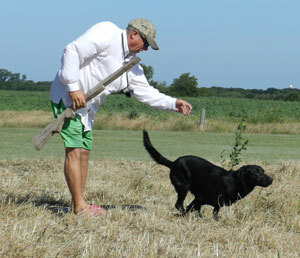 Dan personally develops each retrievers' program with the clients' goal in mind. WHO IS DAN KIELTY AND WHY SEND MY RETRIEVER TO MARKS A LOT FOR TRAINING? Experience: Dan has over 30 years experience training retrievers, 25 years as a full-time professional retriever trainer. Record: Dan has earned nearly 1250 hunt test titles and placed 10 retrievers in the AKC HALL OF FAME. Dan has earned Master Hunter titles on numerous retrievers before they reached the age of 24 months. Retrievers are our primary business and have been for 25 years. Our kennel is 30 miles East Dallas, TX. If your goal is a companion, hunting dog, or hunt test retriever, then Marks-A-Lot is the place to get your puppy and get him trained. Marks-A-Lot has 7 custom ponds and access to over 20 "natural" ponds as well. Thousands of acres of land are used to enhance your retriever's progress. We concentrate on training retrievers for hunting and competitive AKC and UKC hunting tests. Please Note: There is NO difference in the training of retrievers used for hunting or hunting tests. The methods, concepts and scenarios are exactly the same. We train out of boats, duck blinds and tree stands as well as upland hunting scenarios. We us duck calls, decoys and we shoot in the field and at the line. THE STANDARD FOR THE HUNTING RETRIEVER AND THE COMPETITIVE RETRIEVER IS EXACTLY THE SAME.